The Phoenix Poetry Series showcases some of the best poets in our community. The newest installment of the series will spotlight Rashaad Thomas and Joel Salcido at Fillmore Coffee Co. (600 North 4th Street, Phoenix, Arizona 85004) on Friday, October 27. The event begins at 6pm, and the reading will begin promptly at 6:30pm. Rashaad Thomas is a husband, father, USAF Veteran, poet, VONA/Voices of Our Nation Art Foundation Alum, and MacDowell Colony Fellow Winter ‘17. His work can be found in a number of publications, most notably in the book Trayvon Martin, Race, and American Justice: Writing Wrong, Columbia Poetry Review, The Rumpus, Heart Journal Online, and others. He is Arizona State University’s Performance in the Borderland’s “Local Opener” Curator in collaboration with the University of Arizona Poetry Center’s Reading and Lecture Series. He is also a contributor to My Click Urban. Joel Salcido was born a Los Angeles cockroach and smuggled to the Westside of Phoenix, where he translates the poetry of the barrio pigeons into Surrealist prophecies. He is blessed with a beautiful wife and sons, as well as a cadre of talentedly mad brothers, friends, co-conspirators and fellow hood radicals. He writes poetry and prose and is working towards a masters of arts while building a boat out of editor’s rejection letters to float back to the moon. He is also a member of ARTRATs and Chronic Illness. 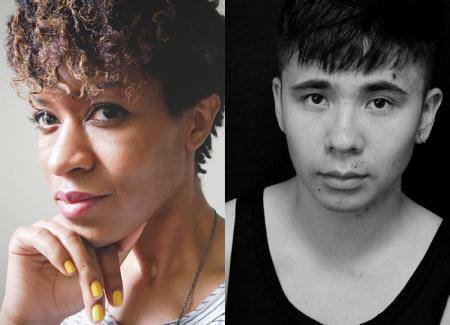 The Poetry Center at the University of Arizona is proud to present Ocean Vuong and Camille Rankine reading at the Phoenix Art Museum (1625 N Central Ave, Phoenix, AZ 85004) on April 7th at 7pm. The opening reader for the night will be Joel Salcido. After the reading, there will be a short Q&A and a book signing. For more information visit The Poetry Center’s website. Ocean Vuong is the author of Night Sky with Exit Wounds (Copper Canyon Press, 2016). A 2016 Whiting Award winner and Ruth Lilly fellow, he has received honors from The Civitella Ranieri Foundation, The Elizabeth George Foundation, The Academy of American Poets, Narrative magazine, and a Pushcart Prize. His writings have been featured in the Kenyon Review, GRANTA, The Nation, New Republic, The New Yorker, The New York Times, Poetry, and American Poetry Review, which awarded him the Stanley Kunitz Prize for Younger Poets. Born in Saigon, Vietnam, he lives in New York City. Camille Rankine’s first book of poetry, Incorrect Merciful Impulses, was published in January by Copper Canyon Press. She is the author of the chapbook Slow Dance with Trip Wire, selected by Cornelius Eady for the Poetry Society of America’s 2010 New York Chapbook Fellowship, and a recipient of a 2010 “Discovery”/Boston Review Poetry Prize. Her poetry has appeared in Atlas Review, American Poet, The Baffler, Boston Review, Denver Quarterly, Gulf Coast, Octopus Magazine, Paper Darts, Phantom Books, A Public Space, Tin House, and elsewhere. She is serves on the Executive Committee of VIDA: Women in Literary Arts, and lives in New York City.